Charms is an archived article about material previously included in Diablo 3. However, it has currently been removed or the article contains outdated facts. The information is stored in Diablo Wiki for posterity. Please note: Links in this article lead to both updated and archived material. Are you looking for the Enchantress skill Charm? As of 25.5.2011, Charms have been removed from the game, but may re-appear after the game ships. It was a cool idea at its core, but right now it's just really too basic and doesn't provide anything you can't get from the armor and weapons you're equipping. It requires a lot of the player to invest time and energy into finding and storing yet another type of item just to add player stats. When they do all that, it's just to do something pretty boring that they can already do with awesome things like armor and weapons. Originally the Talisman had a much deeper design, but it proved very ambitious and it got whittled down over the years to a very basic +stat per single square. We like simplicity in our designs, but charms became superfluous in their purpose'. We really like the core idea, but we don't want to stop everything and spend a large amount of time trying to fix the Talisman, although we do have some great ideas already. So, it'll very likely come back in some form or another after the game ships. And be awesome. Details about charms prior to its removal have been saved for posterity. After long speculation and silence from Blizzard's side, charms has been confirmed to be in the game during the Gameplay Panel at Blizzcon 2010. The D3 Team had long said that charms would not return to the game, and that they didn't like the inventory space trade off that using Diablo 2 charms required. This has now been solved by assigning the elusive Talisman to be an exclusive "charm inventory". Charms will not yield any bonuses unless placed inside the talisman, but they can be placed outside the talisman for storage for future use. They’re all 1x1, regardless of power. Although it would be interesting to introduce other shapes, there are no plans for it. Jay Wilson has specifically stated that charm affixes currently consist mainly of stat attribute bonuses, in other words, charms with strength, vitality, dexterity or willpower can at this point spawn. 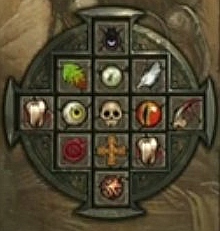 The complete number of affixes that can be spawned is currently unknown, however Jay Wilson mentioned during the Gameplay Panel at Blizzcon 2010 that they didn't like the extremely varying charm affixes of Diablo II. This page was last edited on 13 March 2013, at 20:24.